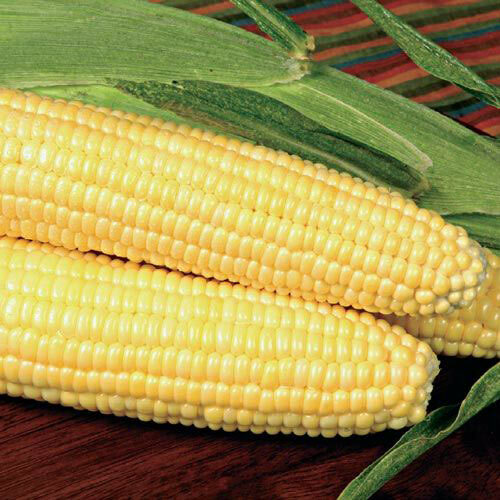 Bodacious RM Sweet Corn | Gurney's Seed & Nursery Co.
Get the same sweet, flavorful and exceptionally tender corn—but with even more disease resistance than the original Bodacious. This improved variety has 16 full rows on every 8-in. golden ear. Enjoy its superior sweet flavor fresh or save some for canning and freezing. RM stands for resistance to common rust and maize dwarf mosaic. Also resistant to Stewart's wilt. 75 DAYS. Spread1 - 1 1/2 feet. Spacing10-12" plant spacing. 36" row spacing. Plant in blocks of at least 4 rows for adequate pollination. FruitYellow corn. 8" ear length. 1.8" ear diameter. 16 rows of kernels. Soil RequirementsNeeds deep, well-drained, fertile soil, pH 6.0 to 6.8 and consistent moisture. Seed CountPacket has approximately 250 seeds, 1/2lb has approximately 960 seeds, 2 lbs has approximately 3,840 seeds. PruningNot necessary to remove suckers (side sprouts growing from the base of the plant). CommentsTender kernels. Superior sweet flavor. Improved disease resistance over the original Bodacious. RM stands for resistance to common rust and Maize Dwarf Mosiac virus. NOTE: Isolate (250-300 ft. or by 3+ weeks maturity time) from all sh2 and su corn.